Color abounds in this stylish jacket with 1 motif worked in 4 different color sequences. Design is made using Omega Sinfonia DK-weight yarn and a size G/6/4mm crochet hook with 4 (4, 5, 5, 6) skeins of brown; 2 skeins each of light gold and gold and 1 skein each of denim, teal, light teal and dark cinnamon. 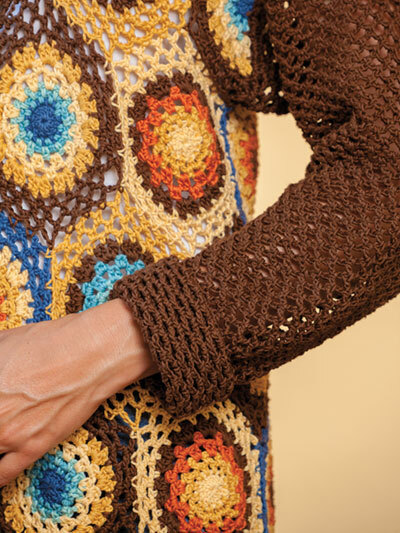 Pattern includes written instructions, symbol crochet for motif, diagrams and schematics. Size: S (M, L/XL, 2XL, 3XL). Originally published in Summer 2018 Crochet! magazine.